Hafa Adai! My name is Evan Cabrera and I am the office manager at Pacific Life Chiropractic.Since joining team PLC in 2006 and becoming a certified Chiropractic Assistant, I have witnessed the many benefits of Chiropractic care in one’s health and well being. Chiropractic helped me with my headaches and posture. It gave me a stronger immune system and energy to deal with everyday stress.With an improved quality of life, I can say that I am now healthier than 10 years ago and will continue to be healthier 10 years from now. Because we believe that everyone deserves to live a healthier life, we do our best to provide our patients the best caring service, top of the line health technologies, and pro-active patient education tools to reach their goals. Health is the most valuable thing one can have so let’s get adjusted Guam! Hi, my name is Sue Leasiolagi. I have worked at Pacific Life Chiropractic since 2003 as an Administrative Assistant and help out with Billing & Collections. I first became acquainted with Chiropractic after my husband was involved in a serious car accident in 1987. He was told he needed to have back surgery, but he refused. Instead he began Chiropractic treatment. He has been able to return to a normal active life and continues Chiropractic care. I get adjusted myself on a regular basis and find that it really helps my immune system as well as reducing the headaches I used to have on a regular basis. My children have been in Chiropractic care off and on from a young age and even my grandchildren now enjoy the benefits of Chiropractic. In 2007, I began my employment as a Chiropractic Assistant at PLC. I continue to learn more about the benefits of chiropractic through training and many other sources. The doctors always have something new and exciting to share with the team. In turn, the team enjoys sharing with family and friends how chiropractic can improve their life in many ways. Chiropractic is not just about getting your back "popped". I was born and raised on Guam. After being injured at work and having low back surgery in 1996, a brother from my Christian church shared his chiropractic success story. He referred me to Dr. Robert W. Gregory. Since being a patient in 1997, I too, have shared my story. I have brought in my whole family, as well as extended family and friends, to experience how chiropractic care changes lives! I continue to share and encourage others to make healthier choices and not rely on drugs, as well as living a healthier life style.I am amazed that my body can heal itself as I invest time in taking better care of my overall health. I have improved my eating habits by introducing more of a variety of raw fruits and vegetables to my diet. With more energy, I am able to walk and swim more, and run for 15minutes! 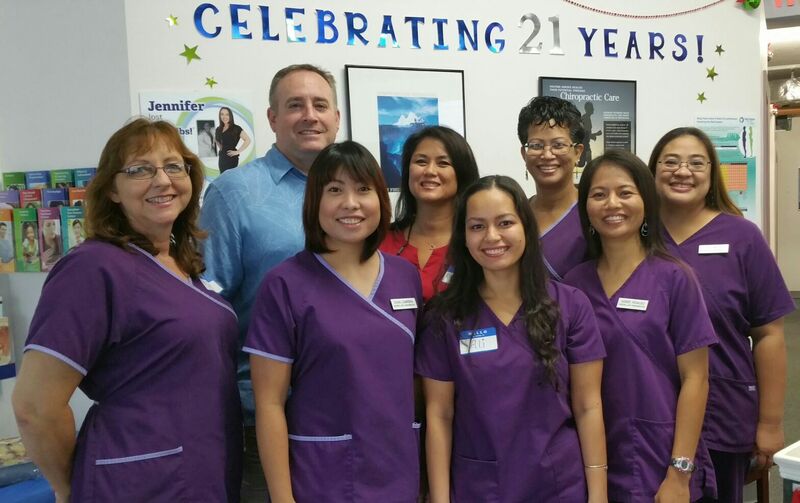 In 2007, I decided to join the team at Pacific Life Chiropractic. I love that I am working with a great and wonderful Chiropractic Team! Every day is a day to expect a miracle! I have learned so much about how the nervous system works. I am now living a healthier life and can share my knowledge and experience with others so they can benefit from chiropractic wellness care! Hafa Adai! My name is Agnes Hidalgo. I am 42 years old, born in the Philippines and raised on Guam. I enjoy cooking, making crafts with my 2 kids, riding my bike, and playing soccer. I learned about chiropractic from working at Pacific Life Chiropractic. The most impacting way chiropractic has helped me is when I got into a car accident. After about three weeks of chiropractic care, the stiff neck, headaches, nausea, and dizziness had gone away. It was such a relief. However, I didn’t stop there. Because of chiropractic, I am able to live and function normally again. I heal much faster than if I didn’t get adjusted. As a family, in addition to exercise and eating healthy, we regularly get adjusted. It helps to maintain a healthy nervous system and immune system allowing our nervous system to function at its optimum level. Our family makes chiropractic care a priority in our lives. Anyone with a spine should get aligned! Beginning Chiropractic care in my early 20's was one of the first steps I have taken in a transformation that has liberated me from the struggle of obesity and directed me toward wellness and optimal living. Today I am a health coach and a member of this amazing PLC team working to connect with people and awaken them to potential healing through healthier habits and Chiropractic care. I love helping people recognize and embrace the role they play in their own health and seeing them change their lives for the better.